Four details… four pictures from Dublin and around Ireland. A small set of curious pictures, just four today, for readers to puzzle over. In a break with tradition, these images are not all from the capital. Two pictures are from Dublin, but the other two from elsewhere in Ireland, from much further afield. Enjoy, and please feel free to share with friends or colleagues. You’ll find an easy link on my page on Facebook. 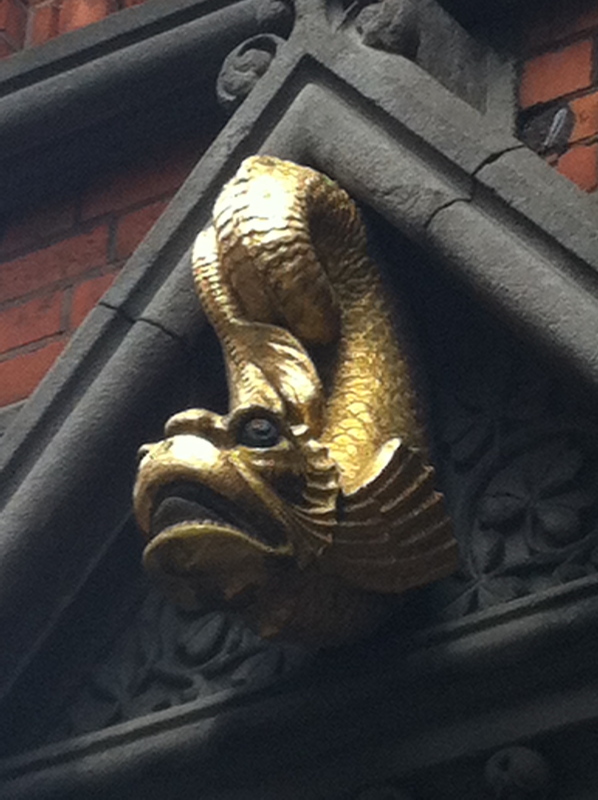 Picture 1- Where is this? Picture 2, below. – Where can you see this group of intrepid folk ? Picture 3- Where is this happy chap below? and finally, Picture 4- It may look mysterious, from this angle, but think about it. Where can you see this rather extraordinary and magnificent sight? That’s it. This is an old post, so the quiz is long closed now. But that just means you can find all the answers straight away, one each, for the next 4 posts. Enjoy! Nice to come across another blogger who likes capturing details like we do! For example, you might enjoy http://foldedcranes.com/2012/06/13/where-the-wild-things-were/ – hope you do! Cheers! Clueless. But the pics give me that eerie feeling. well, I’m sorry to be the cause of such a eerrie feeling Addie. Thanks for stopping by though. Many thanks to Maarit-Johanna for her kind nomination for this blog for the Lovely Blog Award. Many thanks Maarit, it’s a lovely honour. To readers here, I can highly recommend Maarit’s own Blog; history of the ancient world, (see link two comments above) a wonderful blog, full of wonderful pictures and stories from the sun drenched classical world of Greece and Rome. Go see, and enjoy! 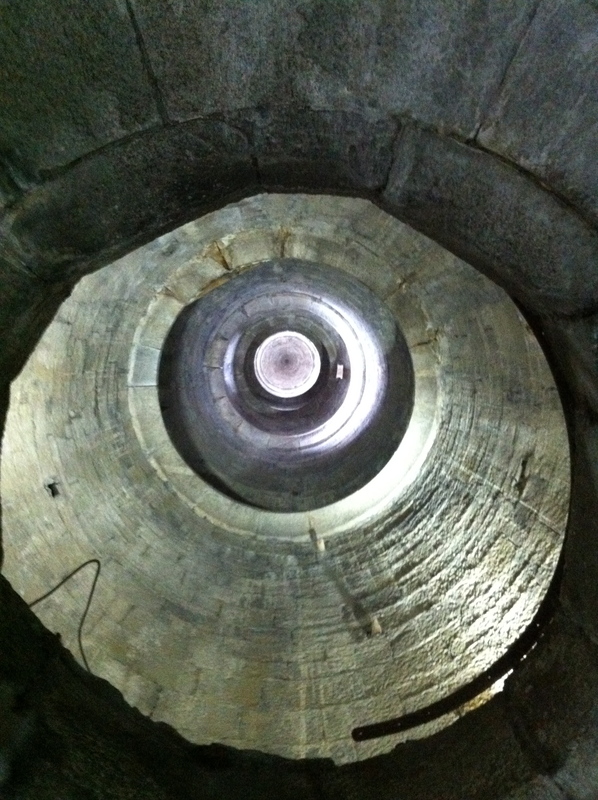 I have no idea really but could #4 be inside one of Ireland’s round towers? Maybe the one at Glendalough or Clonmacnoise? I think #4 is the round tower in G…….. – clue in it being a ‘patriotic round tower’ as G…….. C…….y is the resting place of many Irish patriots. Nice work Rachel, you’ve got it. I’ve temporarily blanked out part of your answers, just for a day or so, but, rest assured, they will re-appear, and your answers are correct. If you get another minute to think about over the next two days, would you like to guess (or Google then guess) which patriot? 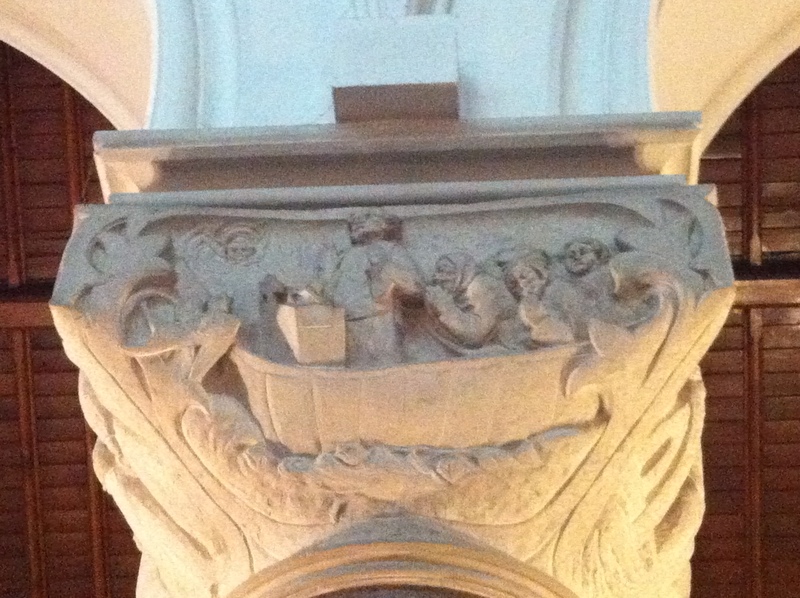 No 2 looks like St Columba/Colmcille escaping with a copyright infringed bible towards Iona. He is talking to his trademark dove with his posse of monks behind him. No idea where it is… maybe in St Columba’s on Iona Road in Glasnevin, St Columba’s school or one of the St Colmcille’s churches. Now that is a very nice, smart piece of guesswork by Oisisn. It’s not the right saint, but I really like the idea of Columba/Collumcille escaping with the famous copyright-infringed bible! His copyright-infringement is one of the best stories from ancient Ireland, and the following legal row about this book (specifically a psalter in fact) that provoked a war! As I say it is not quite the right saint or story, but definitely getting on the right track, ie: it is a saint and a monk & missionary, he is in a boat, and undertaking a voyage. Oisin is also absolutely right to look for the location of the carving in a church or site named after the specific saint depicted. Very close, unlucky but only just. Best answer so far. Nice work. Anybody else going to take a shot? Guess from your clue re 2 that the saint is Brendan The Navigator. People are getting closer. Right saint this time, from Alan. Only the location is now missing. West rather than SW. Possibly the last of the Irish cathedrals to be built. Among the idea I toyed with were some sort of strange angle at the Wonderful Barn (Leixlip) or the Parson Telescope at Birr Castle! Alan has also guessed correctly no.-4. That answer, and all answers received will be published in the next day or so. Does anyone else want to have a go before they are? No, that’s really silly. Clonfert is very ancient! Loughrea it must be. I was at a wedding there once and it’s 19th century I think. At last !! Yes, that’s right, the column in the picture can be found the late 19th century RC Cathedral of Saint Brendan, in Loughrea but of the (RC) Diocese of Clonfert. Not to be confused with the original cathedral of Clonfert itself, a very ancient building as Alan says. In fact it was founded in 6th century by Saint Brendan himself. It is of course C of Ireland these days. The late 19th century RC cathedral in Loughrea is also a building of considerable interest and merit. More about this tomorrow for anyone interested. You’re absolutely right Rachel, it is Loughrea. See my post above. More on the cathedral, on Shorthall and on Saint Brendan himself in the next post, coming out later this evening, in the next hour or so. Well done, you are beating the clock nicely! 🙂 It is of course the O’Connell round tower. Excellent link to archiseek piece on Loughrea by the way. I visited three weeks back and became interested, then did some research for this next piece. Some good clarifications in your link though, Thanks for that. Correct on both counts, church & angel, yes. In fact, I’m just about t go to press with a piece that contains answer 2- so I’ll give a big last minute clue for number 3. Same county,(as pic 2) but urban setting. of course, but which church? 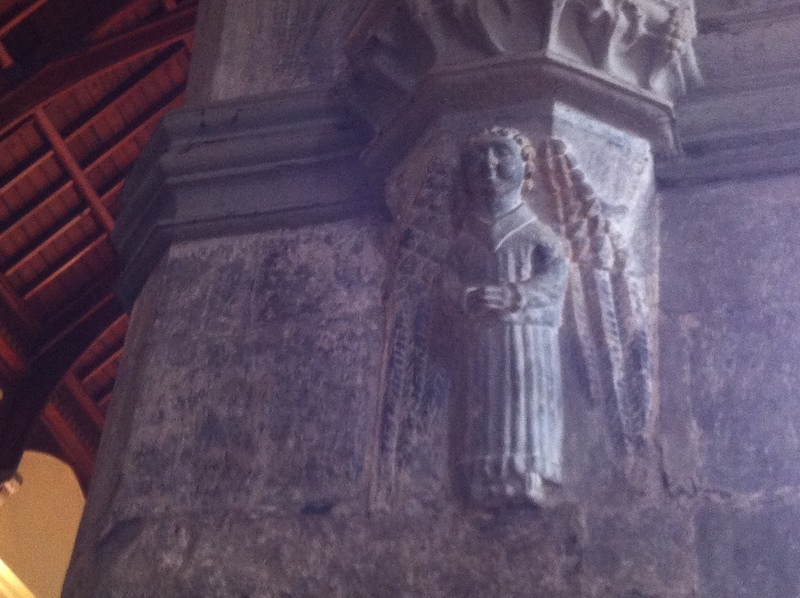 The angel on the column looks old, no? St Nicholas C OF i ? Bingo, that’s the one. See answer 3, published earlier this evening. Previous Post Results of Doors of Dublin Quiz. Next Post Answer 1… Dolphin House, & the influence of John Ruskin.